Promote inner-calm and wellbeing with this all-natural brew of leaves, herbs and spices. This caffeine-free tea features a robust combination of cinnamon, cloves, ginger, cardamom and allspice without any calories. 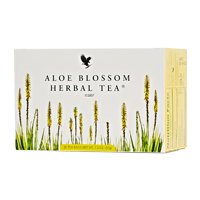 Refreshing, soothing and naturally low in calories, Aloe Blossom Herbal Tea is delicious served warm or with ice as a refreshing alternative. Each pack contains twenty-five individually foil-wrapped sachets. For hot tea, use one tea bag per cup. Add boiling water and brew 3-5 minutes before removing tea bag. For iced tea (one quart), pour 2 cups of boiling water over 4 tea bags and brew 3-5 minutes. Remove tea bags, add 2 cups of cold water and chill. Cinnamon, Orange Peel, Cloves, Blackberry Leaf, Allspice, Fennel, Ginger, Cardamom, Aloe Blossoms, Gymnema Sylvestre, Chamomile. Copyright © 2019 Forever Living Products Ireland Ltd.. All rights reserved.